Medina Yard is a significant urban brownfield site located within walking distance of Cowes town centre, occupying a highly prominent stretch of river frontage approximately 500 meters in length at the mouth of the Medina Estuary. 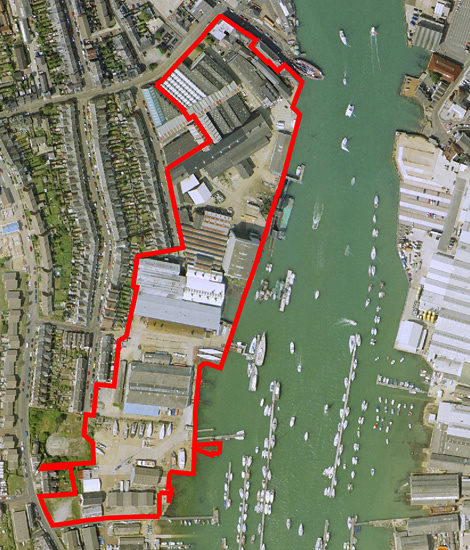 Medina Yard is currently the single largest brownfield site with development potential in the Cowes area. Although re-use / redevelopment for large-scale industrial use is not a viable proposition, the site has potential to play a leading role in the regeneration of the Medina Valley and deliver significant long-term benefits for the entire community. For more background about Medina Yard please go to the Community page and download the Community Planning Weekend Exhibition. 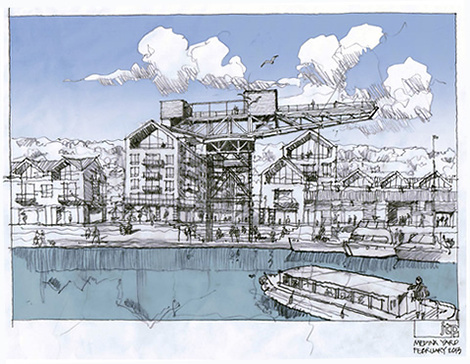 The Hammerhead Crane is located in the centre of the Medina Yard site and is a prominent waterfront landmark. The Vision for Medina Yard created at the Community Planning Weekend in 2013 included the retention of the crane and a range of social and economic benefits as part of the site’s regeneration. The crane continues to be part of the developing masterplan, benefitting from the proposed regeneration of the site. The Hammerhead Crane is not currently in the ownership of the Harrison Trust, but the project team have commissioned a survey of the crane’s structure and general condition with a view to undertaking health and safety related work on the crane.